The following is a memorandum outlining how St. George’s Church and the Episcopal Diocese of New Jersey found a way forward where St. George’s was able to retain their property while at the same time find a peaceful way forward to a settlement that satisfied the Anglican congregation, the Episcopal Diocese and the Presiding Bishop. It can be done! Is it an aberration in relations between Anglican Churches and the Episcopal Church, or a new way forward? There has been much acrimony with hundreds of pending lawsuits across the country between Anglican Churches and the Episcopal Church. Might this case be a pattern for a way out from the litigation? That is the question on the minds of laity, clergy, bishops, and lawyers on both sides in the wake of an historic settlement between St. George’s Anglican Church in Helmetta, New Jersey and the Episcopal Diocese of New Jersey. And this happened all with the full knowledge and consent of the presiding bishop of the Episcopal Church and her chancellor. The ink is dry and the papers are filed in the Middlesex County clerk’s office following a routine real estate closing there on Tuesday, November 23, 2010. It is a settlement which might portend a way forward out of the litigation which has engulfed the Episcopal Church and parishes which have left it for other Anglican affiliations since the election of Katherine Jefforts-Schori in 2006 to be the presiding bishop of the Episcopal Church. 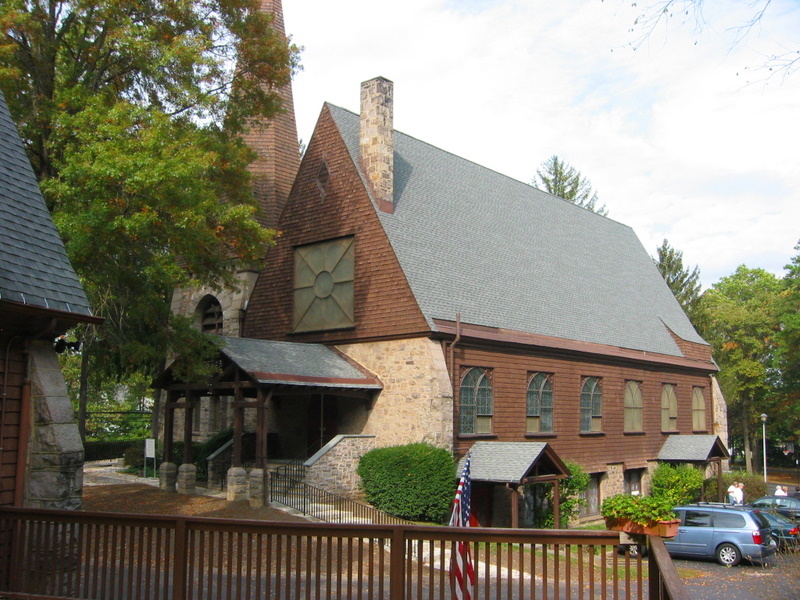 The deal involved a former Episcopal Church congregation which disaffiliated from its former denomination, yet negotiated with the diocese to retain its church buildings and tangible property with complete independence from the former denomination. The congregation is now affiliated with the Convocation of Anglicans in North America (CANA) under Missionary Bishop Martyn Minns and the Anglican Church in North America (AC-NA) under Archbishop Robert Duncan. The property which was the subject of this negotiation was given to the newly incorporated Episcopal Church parish in 1894. It is located at 56 Main Street, Helmetta, New Jersey. The church building was built in 1896 on land which was given to the parish in 1894 by The George W. Helmet Company. George W. Helmet was the owner of the large factory located near the church and the person after whom the town of Helmetta was named. The property consisted of a large rectangular site which measured approximately 555 feet along the road frontage and 290 feet deep into a wooded area consisting of 3.7 acres of land. The church building built on the property is a traditional high peaked ceiling church building of about 2,900 square feet in the worship area, and beneath which is a basement consisting of offices and meeting rooms occupying about 2,700 square feet. A single family 2,900 square foot two story rectory was built on the property, as well as Ericson Hall which consists of a 5,600 square foot fellowship hall, larger than the church itself. The property has paved driveways and parking lots, and four utility sheds. The property is adorned with decorative stone walls and a stone staircase between the church building and the road. The parish owned the land and buildings free and clear with no mortgage on the properties. 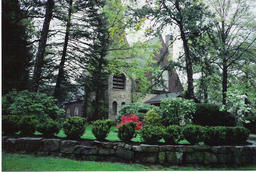 In early January and February of 2008 the former Episcopal Church, then known as St. George’s Church in Helmetta, New Jersey, cut its ties to the Episcopal Church and the Diocese of New Jersey and asked to be placed under CANA and its suffragan Bishop David Bena. CANA accepted the parish, and since then Bishop Bena has made numerous episcopal visits to St. George’s. The priest at the parish of St. George’s Anglican is Fr. William Guerard. Fr. Bill, as he is known by his people, was an Episcopal priest for 22 years. His relations with the Bishop George Councell, the bishop of the Diocese of New Jersey were always extremely cordial. When the congregation was thinking about making this move, it was no surprise to the bishop. Bishop Councell asked Fr. Guerard to keep him fully apprised as to the progress of the parish in this respect. And Fr. Guerard did so. Both Bishop Councell and his representatives came to the parish and addressed the vestry several times to talk about these developments, both before and after the vote by the vestry to leave the Episcopal Church. The bishop and his people were extremely gracious to the parish, and the parish was likewise quite respectful toward the diocese and the bishop. On October 17, 2008 Fr. William Guerard, the two wardens of St. George’s, and Raymond Dague of Syracuse, New York, the attorney for the parish, attended a standing committee meeting of the diocese at the diocesan headquarters in Trenton, New Jersey. In attendance at that meeting were Bishop Councell and his chancellor, attorney John Goldsack. Bishop Councell on two occasions at that meeting said to the people from St. George’s, “If there is any bishop in the Episcopal Church you want to negotiate with over something like this, it is me.” The meeting was very cordial, but no decisions were made by anyone at that time, except to keep the lines of communication open. Fr. Guerard had previously told the bishop that they would not need to bring a lawsuit, because the parish would leave and find another place to worship if the bishop wanted that. But Bishop Councell asked them not to do that, to stay in the church buildings and to negotiate a deal with the diocese. On January 9, 2009 some of the people who worshiped at St. George’s organized a New Jersey religious corporation named St. George’s Anglican Church. It was this church corporation which ultimately negotiated the deal with the diocese. On January 12, 2009 the newly incorporated St. George’s Anglican Church communicated to the diocese the desire to retain the property and offered the diocese $360,000 to do so. The three page letter of the parish signed by the wardens and the rector of the parish provided for the first year’s payment in an $18,000 lump sum, and payments of $1,500 per month over a 20 year period. In exchange for that the diocese would give to the parish a general release of Dennis Canon and any other claims by the diocese to the property of St. George’s. At a Standing Committee meeting in January the diocese reviewed the offer, and met to discuss it, but did not give a formal answer to the parish’s proposal. The offer was ultimately refused in late 2009, but the diocese made no counter offer, yet the diocese indicated the desire to keep negotiating. Fr. Bill Guerard left the church as an Episcopal priest and switched his episcopal oversight and holy orders to Suffragan Bishop David Bena of CANA. Bishop Bena has made numerous pastoral visits to St. George’s Anglican since assuming his oversight role at the parish. Bishop Councell never deposed or inhibited Fr. Guerard from his ordination vows as was done with over 400 former Episcopal clergy who left the Episcopal Church for CANA and other Anglican groups. Canon law does not require an Episcopal bishop to depose or inhibit a priest who transfers to another Anglican group, but many Episcopal bishops have done so under similar circumstances. New Jersey law is one of the toughest in the country for a congregation which departs from the Episcopal Church. The 1980 case of Protestant Episcopal Church in the Diocese of New Jersey v. Graves, 417 A.2d 19 (N.J. 1980) basically gives the greatest possible rights of any state in the nation to the diocese as against a departing congregation. Further, the New Jersey statutes (N.J.S.A. 16:12-16) allow the Episcopal diocesan convention to adopt a resolution which unilaterally dissolves an Episcopal Church which has ceased to exist by declaring it so, and filing a Certificate of Extinction of the parish. Upon the filing of the Certificate of Extinction with the county clerk, the title to the former property of the congregation transfers to the diocese without the necessity of a deed transfer or any action by the congregation. At the diocesan convention on February 28, 2009 the Diocese of New Jersey adopted such a resolution, and filed the Certificate of Extinction in the Middlesex County clerk’s office on March 11, 2009. These acts had the legal effect under New Jersey law of effecting an immediate dissolution of the old Episcopal Church religious corporation and the consequent vesting of the title to its property in “The Trustees of Church Property for the Diocese of New Jersey, successor in interest to the Rector, Wardens and Vestrymen of St. George’s Protestant Episcopal Church, a dissolved corporation.” All that the diocese would have then needed to do was to commence a simple eviction proceeding to evict the Anglican Church congregation and take over the property. The defense of such an eviction would have been only a facial challenge to the caselaw and salutatory scheme. It would have been a difficult eviction to defend. Yet despite the strong legal position of the diocese, Bishop Councell assured Fr. Guerard that this in no way would interfere with the continued use by the parish of the property. Bishop Councell asked that they continue to try to negotiate a resolution to the use and ownership by the new Anglican parish. St. George’s took no legal action against the diocese to challenge this in court. But the diocese likewise did not go to court. The bishop and the diocese continued to talk and negotiate with the parish. In September of 2008 the parish had an appraiser do a formal written appraisal of the property value which came to $1.7 million. In early 2010 the diocese paid the same real estate appraiser to reappraise the property, and the figure was revised to $1.6 million. According to the tax assessment records of Helmetta, the land is worth $732,000 and the improvements to the property were worth $1,066,800 for a total value of $1,798,800. Numbers in this magnitude were a non-starter for the congregation, and the parish told the diocese that. In early 2010 the parish made another offer to the diocese. The proposal was for a total of $700,276.80 consisting of a $30,000 down payment and a mortgage amortized over 30 years with zero interest to be held by the diocese for the $670,276.80 balance of the purchase price. The parish offer was that they would pay the $1,881.88 per month payments for 15 years and at the end of 15 years, the diocese would get the remaining unpaid balance as a balloon payment of $335,138.40. The parish told the diocese that this was all they could afford to pay. The alternative was for the parish to move out, leave the keys, and let the diocese sell the property for what they could get for it. As with many old stone church buildings, it is in need of much maintenance. While the church and other buildings could never be rebuilt for the appraised price, neither did the diocese have an attractive prospect for selling it to an outside buyer for what St. George’s offered. In the week previous to Sunday, May 23, 2010 Fr. Guerard got a call from the bishop and was told that the diocesan Standing Committee accepted the terms of the sale proposed by the parish. On that Sunday Fr. Guerard announced the acceptance and the terms to the parish at the Sunday morning service. The Standing Committee of the Diocese of New Jersey and I met with Canon John Wood Goldsack, Esq., Chancellor of the Diocese, on June 17, 2010 to review the terms of the proposed agreement for the sale of the property of St. George’s Church. The Standing Committee approved the terms of the agreement. I also gave my approval. Canon Goldsack will prepare a formal agreement and forward it to you for your and the Vestry’s review and action. You and the people of St. George’s remain in my prayers. The chancellor for the diocese wanted to draft the purchase contract, and on August 17, 2010 he wrote the lawyers for the parish and confirmed the terms of the deal. As part of the approval process we will also submit the documents to the Presiding Bishop and her Chancellor for their review and comment. It is possible that there may be some modifications as a result of this review. On October 28, 2010 both New Jersey Bishop Councell and Chancellor John Goldsack signed the agreement which the lawyers had prepared, which consisted of a contract prepared by the diocese and a rider to the contract prepared by the attorneys for the parish. On November 5, 2010 the senior warden of the parish signed the agreement and the rider. From then on it was a matter of getting the title documents ready for the closing. The closing for the sale took place on the Tuesday before Thanksgiving, November 23, 2010. In many discussions around the nation where there have been talks between Anglican Churches which have departed from the Episcopal Church, the diocesan officials have proposed a 5 year period after the sale when no non-Episcopal bishop would be allowed to visit the property which was proposed to be sold to the departing parish. To date this is the first such sale, so there are no other actual completed transactions with which to compare this transaction. But at no time during any of the negotiations did Bishop Councell or his people make this request of St. George’s as a condition of their purchase. The deal which the parties struck in this case in fact has no such restriction, and the CANA bishops will continue to minister to the people of St. George’s Anglican Church as they have for the last several years. It is hard to say for certain why this transaction worked an amicable settlement rather than litigation while so many other cases around the country have resulted in lawsuits. Litigation has resulted in great cost to all parties and the ensuing bad publicity for everyone. However it is clear to me that the very good relationship between this particular Episcopal Bishop and the rector of the parish played a huge part in the settlement. The parish was willing to walk away from the property if the bishop said so. The bishop was willing to negotiate with the parish rather than take over an empty building which would then be sold to someone else. The legal framework, despite being highly favorable to the diocese because of the law and court decisions in New Jersey, was never allowed to drive the interactions between the parties. This negotiation was conducted over the course of over two years with the presiding bishop and her chancellor well aware of what was happening and the terms of the deal. Much can be said and much has been written about the litigiousness of these kinds of cases. But the St. George’s in Helmetta, New Jersey goes to prove that when the parties both desire to find an amicable way to sell a formerly Episcopal Church to an Anglican Church which has disaffiliated from TEC, that a way can be found. There is no legal bar to such a sale, nor is such a sale, even at a fraction of the appraised and assessed value of the property, in violation of the fiduciary duty of the diocese or TEC. Where there is the will to be gracious and settle without lawsuits, there is a way that it can be done, because it was done here. Can it be repeated elsewhere? Perhaps the Helmetta experience might be repeated. It need not be an isolated incident if both parties in other cases have the good will to try it. Tip of the Tinfoil to the wonderful folks at the AAC – thank you!! This entry was posted in Anglican News, CANA, Episcopal News, General Convention, http://schemas.google.com/blogger/2008/kind#post, Presiding Bishop. Bookmark the permalink. I'm very surprised that there wasn't a Scout or DavidH or JSchwartz type in that congregation to stir up one of those “loyal” Episcopalian groups to obstruct this very Christian process. If there were a peaceful settlement between the CANA parishes and the Diocese of VA, it would involve a similar financial settlement. How much are those properties worth? What would be a reasonable settlement figure? I'm impressed that a bishop who had all the legal levers in his hand to take the “easy way” out chose the hard way. The way the author described New Jersey law its clear that had the Presiding Bishop been Bishop of New Jersey it would have been a case of “here's you hat, what's your hurry” to the congregation. 1. the departing group appeared to have a good sense of their legal position and raised the possibility of purchase respectfully. 2. the departing group offered to leave the property if that was the wish of the Bishop, but requested that their offer be considered. 3. there was no assertion by the departing group that they had some kind of right to take or to keep the property. 4. there was no unauthorized occupation of the property by departees. 5. there is no indication in any of the documents I've seen on this that there were continuing Episcopalian worshippers who desired to use the facilities (I'll put to one side for the moment Carolyn's comment). 6. there was, apparently, a long- standing cordial relationship between the rector and the diocesan bishop. This leads to the Sesame Street question: How Is One Thing Not Like Another? Where these circumstances exist, I would think a Diocesan Bishop could freely consider a reasonable arrangement. If I were on his standing committee, I could approve this deal in a minute, based on what I know about it now. Another key aspect of this situation is that the arrangement was not opposed by the National church. I tend to side with those who believe these issues should largely be decided at the Diocesan level, but I think this case disproves the very popular notion that 815 is on some kind of blindly enraged mission to forbid any of these kinds of arrangements. So, three huzzahs for Saint George's and the Bishop. Now, back to Carolyn's unfortunate comment. I don't know DavidH or JSchwartz personally, but I can say categorically that none of us has ever been in a situation where we “stirred up one of those loyal Episcopalian Groups to obstruct the sale . . .” etc. I can say this with some certainty because I don't think any such thing ever happened anywhere in the United States. It certainly hasn't happened in the parishes I know best. We have a situation where some parishioners left to affiliate with a newly formed denomination. Some stayed and continued as Episcopalians. Full stop. It is between these two groups that the courts in Virginia and elsewhere are now forced to sort out who has the better claim to property. PS: re the inquiry from Anon 2049 – Valuation is a tricky thing. The logical date to pin a value to these properties is as of the date of the occupation – late 2006. I would think that a figure in a few tens of millions of dollars range would probably cover it. Of course, the problem in the CANA/Diocese of Virginia situation is that some of these parishes are quite old and have a central place in the history of the Diocese of Virginia. When one gets into these non-monetary aspects of value, things get even trickier. Sometimes you get into one of those “priceless” situations that they talk about in the credit card adverts. Could one arrive at the conclusion that Scout does not seek a mutual resolution that would benefit all parties – could this be true? 815 may be losing its appetite for more litigation or the Bishop of NJ may have politely noted that the PB really has no authority in his diocese. Perhaps if Bishop Lee had gathered the fortitude to oppose Bishop Schori, we would have by now completed a peaceful settlement to the ongoing altercation. While I still hope that negotiations will break out, there are several bars to that in the VA situation including ego, the unwillingness to justify the many $$ spent on litigation, and the very high cost of real estate in the area. Anon 2011, of course the answer is “No”. One couldn't conclude that. My suggestions about settlements go back quite some time. Of course, what is reasonable, fair and mutually beneficial will vary from parish to parish, diocese to diocese. The St. George's situation wouldn't work at, say, Truro. But, of course I favor reasonable settlement of these disputes. I think it could work – if it is on our heart to seek it, not because we have all the answers or in the rightness of our cause (whatever side we may find ourselves) but because we serve a God who is amazing in His creativity and remarkable in His mercy. Scout – I did not say that you or the others ever stirred up the opposition group. As DavidH would say, “misdirection”. Clearly the goal of the DofV and 815 in the case of TFC is to retain only the historic church, sell off SouthGate to commercial development, and raze and sell off the property that the Main Sancturary is on. There should be enough of a remnant to maintain some symbolic level of a parish for the Historic Church. Sorry – I meant “type” to mean “type”. It basically sounds like NJ had an unwritten version of the Standstill Agreement, but unlike in VA the DioNJ didn't walk away and file lawsuits. Steven: I would think another comparison would be to the way the Diocese of Virginia worked with the Rector and leadership at All Saints Woodbridge. In this New Jersey example, it sounds like the departing group approached the Bishop respectfully (no letters from the vestry calling on him to repent, no bans on his presence on the property, for example), made no claim to be able to occupy the premises by force of numbers alone, offered to vacate if the Bishop so directed, did not file legal claims in the secular courts seeking title to the property, and took no actions to terminate or exclude Episcopal worship. In other words, an environment that made constructive dialogue a very real possibility. I see some differences between their situation in New Jersey and the ones I saw in Virginia. We can have different views on which approach is the more intelligent and reasonable, but we can't get in a time machine and start over. A reasonable settlement in Virginia will carry with it the history of how events unfolded here. That is what we had – remember, Bishop Lee created the Special Committee and he worked closely with the leadership of the congregations preparing to vote. It was very similar and went on for a year in preparation for the vote (2005-2006). This was the spirit in which we moved forward (outlined in the way the Reconciliation Commission also worked (2005) – a commission that led Bishop Lee to create the Special Committee), of which the All Saints Dale City was the prototype. The change happened a month before the vote when Bishop Schori took over 815 (Nov 2006). The votes took place, for the most part, in Dec. 2006 and recorded. The Standstill Agreement was put in place to follow the same pattern as the negotiations/resolution of the All Saints property. It was suddenly abandoned a month later in Jan. 2007 and Bishop Schori (not Bishop Lee) filed the first lawsuit. Now we see in the NJ case that she has changed her position and this is very helpful and very hopeful. The matter before us is to encourage and pray for the leaders who are taking steps to discuss how we might also move forward in resolution. Which is why it was very wise for the Resolutions Committee to put forward the resolution calling the diocese to pray. The CANA Congregations join the diocese in that commitment to pray – and that is a good start forward. I know for myself, the challenge is an issue of forgiveness. There's been much pain and disappointment and miscommunication and grief. The place we can take this is to the cross, where there is true equality. Hard as it may be to believe, I don't carry around depo transcripts with me, but perhaps she was referring to filing an opposition to the CANA parishes' petitions and to seeking a declaration that would clarify the Diocese's rights. At that point, I'm quite sure the Diocese would have taken those actions regardless of what Mrs. Schori purported to do. Just to illustrate how little leeway the Diocese had once the departing groups went to court, I rather think the Diocese would have done exactly what it did even if 815 had told them not to. BB – You're right to emphasize that those of us who were cast out of our home need to focus on forgiveness for the occupations of the buildings and the banishment of Episcopalians. However, the “win-win” we're all looking for will swing primarily on the practicalities of making sure the properties are preserved for Episcopal worship and use. That may be, at least temporarily, some condominium use of some of the properties or a lease of the properties to departing groups on a transitional basis, with provision for access by Episcopal clergy and worshippers. Step One: The properties are formally titled to the Diocese of Virginia – not the congregations. Those properties which the Diocese believes they can support on their own with the existing congregations the CANA congregations will be asked to vacate – details subject to negotiation. In cases like TFC, a joint use agreement could be worked out. In the case of properties where there is no viable EPISCOPAL congregation the property will still be titled to the Diocese but the CANA congregations remain in place taking care of all maintenance and taxes with periodic diocesean oversite. The CANA congregations must give the diocese a 2 year notice if they intend to vacate the property – so as not to drop an economic bomb on the financially strapped diocese. At that point the diocese will assume all financial responsibility for the property. Step Two: If the diocese does not request CANA vacate the property within 10 years and/or is unable to uphold its financial obligations on the properties it has formally asked to retake day-to-day control of, in lieu of being sold it will FIRST be offered to CANA SOLELY at the cost of said obligations, the diocese will agree to turn the properties over to CANA in full. If the diocese has just run up the bills or not done the maintenance, CANA can decline. The diocese could take out a mortgage on the property, but CANA wouldn't have to assume it. So if the diocese opts for the “throw the bums out” strategy the titles would be worded so that they would be first offered to CANA prior to being sold. Don't know if that's legal, but that's for the lawyers to work on. The diocese can be prideful and try to absorb the financial costs, which in the case of TFC are substantial, but eventually it will bleed the diocese dry. Not to mention what a poorly maintained property in the middle of a city might do to the diocese's reputation. For better or worse, the two sides would be tied together for a decade. Interestingly, this could put the diocese in the position of having to decide where it stands vis-a-vis TEC innovations. If I thought the bishop of VA were actually going to stand up to the direction of the GC and TEC I might….might be persuaded to return…which would mean an assertive diocese could win back members from CANA. Of course, I'm also a Cub fan…so, maybe next year. I don't really think that is going to happen, but I am talking possibilities, not probabilities. Finally: Everyone pays their own lawyers. As a CANA member, I really find this offer irksome, but I am willing to give the diocese a chance to “make it work” before asserting what I think are our own just claims. Here's my cloak and my staff and I'll walk another mile…if you please. As for requests for rent, I think that would be unacceptable as most of these congregations would not want one dime going to the national church – whose actions were at the root of this. This is not meant to be THE solution. Like I said, I'm just throwing it on the table as a starting point. So, please lets skip an ad hominem attacks. BabyBlue is surprisingly graceful in her editorial oversight here. Reading the world as it comes through these comments, I am never able to understand Scout and others who steadfastly insist on a history that never was and never will be. BabyBlue's account of the Standstill Agreement of 2005, and of Bishops Lee and Schiori is fair and true. The ongoing effort to rewrite that history, as if the now-CANA congregations fired the first shot, is historical revisionism of the worst sort. Bishop Lee saw what was coming, and in his own frail, but forward-looking looking ability, made promises about what would happen in the Diocese of Virginia when he authorized the Special Committee to create the conditions for a peaceful division. When Schiori, the “new sheriff” (in his own words) came to town, he stumbled with tragic moral and ecclesiastical cowardice– and the rest is our sad story. Why is it, Scout, that you refuse to own that history? I'm not angry at you; I just wonder why you don't own up to what happened? It seems we could have more honest and hopeful dialogue if you would do so. Always hobbits – please understand that the DioVA has a story to tell and a position to defend. Mere facts will not be allowed to stand in the way of the official position. AH – I don't think I have been particularly focussed, at least not in this thread on BB's version of history. I believe her to be a very sincere person who has lately put her shoulder to an admirable effort to promote some kind of settlement as an alternative to continued litigation that costs both sides a great deal. I share her view that a non-litigation solution is preferable to continued money going out of the churches into law firms. we're still looking at years of litigation if this thing wends its ways through all possible levels of judicial process. Anything I have said in this thread I think is factually accurate re distinctions between the situation in NJ and the situation in Virginia. I haven't heard anyone dispute that those distinctions are factually correct, although I suppose folks could quibble about how big a difference any one or all of them are and how much it matters. But it certainly is true that the New Jersey parish did not attempt to occupy the premises, did not exclude Episcopalian worship, and offered to leave. I have also acknowledge that (in my possibly misguided opinion) that the Bishop and the Diocese did send signals that made the situation worse rather than better in the 2003-2006 period. So, if that's the point you're making, I'm on board. I would have preferred that the Bishop send very clear signals to rebellious clergy that they were free to leave, but that they were not free to stay and foment schism. If he had done that, we would have some lovely new CANA churches gracing our landscape now and none of the turmoil of exiled congregations and wasteful legal fees. I do think that there is a counter-factual propaganda effort in circulation that likes to ignore the reality that the CANA congregations went to court first. This meme paints the CANA petitions and seeking, in response to that filing, a declaration clarifying property rights. I would have deemed it shameful for a Diocese and its Bishop not to oppose such a tactic. But therein lies the divide between me and others who come to this site to exchange views. I keep repeating over and over and over again – the Congregations filed petitions recording their votes. The Standstill Agreement, which was drawn up by the Episcopal Bishop of the Diocese of Virginia, recognized that that filing was not hostile. This must be the reason why the Diocese of Virginia has not put the Standstill Agreement on their legal webpage – it contradicts the story they keep telling the laity. How many times do I need to repeat this? The filing after the votes was not considered hostile by the Diocese of Virginia – and do you know why? Because the second part of that petition was NOT FILED! We did not request transfer of the property – how many times do I need to repeat that? The years of conversation and negotiation had led all parties to think we were now going into the property settlement stage as first demonstrated in the All Saints Dale City case. We had all ready been discussing the numbers that we would pay for the properties (so why would we lay claim when we thought we would pay millions?). This must be why the Standstill is not on the diocesan website, it contradicts the official diocesan story and that, my friends, is a big problem. Yes, it painful to realize that Bishop Schori, upon taking over 815, intervened and railroaded years of work right off the tracks. And yes, it was Bishop Schori who filed the first lawsuit (possibly because she was not convinced the diocese would do so – and so the lawsuit could be extended to the diocese as well). To this day the Diocese and 815 operate separate legal counsels so it is not inconceivable that at some point the diocese could choose to go in a different direction than 815. As we have seen in NJ and SC and even Dallas, 815 has backed off threatening dioceses when they turn to resolution instead of litigation to settle their differences. BB – let's test your theory. Read the CANA petitions that were filed (or any one of them – I think they are identical or nearly identical) and then tell me where title would be now if the Diocese had not filed oppositions. My view is that non-opposition would have resulted under the Division Statute in title conclusively having passed to the departing factions. Do you think otherwise? If the diocese had not filed oppositions in early 2007, under what legal theory could either the Diocese or the individual Episcopal parishes have in later years (let's say this year or next, for an example) have asserted a right to possession, use or enjoyment of the properties? I sure can't think of any. Under your theory thus far, I think you believe that there would have been a piece of paper at the courthouse with a vote recorded on it and it would have had no effect on legal title. I do not think that is a realistic assessment of the effect of an unanswered petition of the sort that the CANA groups filed. I am telling you the truth, Scout. That's why the Standstill makes it clear that the filing of our votes – the only thing that was filed with the court – was not hostile. We did NOT REQUEST TRANSFER OF THE PROPERTY – PERIOD. I don't know what the counsel for Bishop Schori told the leadership of the Diocese days before we were to attend Bishop Lee's first Property Committee (what he jokingly referred to as the “Get on With It” committee) – I was not in the room. I was in the room when we made it abundantly clear that we were not asserting rights or requesting transfer of the property or any of those things – we could have, but we did not – because we thought we were going to give millions and millions of dollars to the diocese for the property. The Diocese of Virginia did behave in a similar fashion as did the Diocese of New Jersey. There was virtually three years of work that was undone when Bishop Schori intervened in January 2007. Bishop Schori filed the first lawsuit – I know because my name was on it. So, back to my question: Read the court filings of the CANA groups and then tell us what you think the legal effect would have been if the Diocese had not opposed the court filings of the CANA groups that were submitted the week after the December 2006 votes? Would there today be a tenable legal position that title rested with the Episcopal parishes and/or the Diocese? The petitions go far beyond a mere one-page statement saying “A vote of members was taken and the result was [insert result]”. The standstill agreement (DavidH has done an adequate job of addressing its history and I have not heard anyone challenge his facts about it so I need not repeat that discussion), whatever their impact, did not require the Diocese not to respond to court filings that sought to invoke the Division Statute to seize property. 1. The bishop and dissenters participated in a month's long discernment process that resulted in said agreement/protocol. 2. The standing committee “received it”, nothing more. Had the committee accepted the protocol, we wouldn't be having this argument because the meaning of filing the votes would have been clear to all. Had Bishop Lee had the confidence to stand by the protocol, we wouldn't be here. Maybe CANA shouldn't have filed the votes, but exactly what else was there to do? This is much like arguing over the Munich Conference of 1938 in the middle of D-Day invasion in 1944. I'd humbly suggest we deal with the here and now. I know it gives some folks here the hives, but I keep coming back to the Standstill Agreement, a document by which the Diocese and TEC expressly committed to seek to negotiate in good faith, and then walked away from without even taking the first step in negotiation. It is troubling for Diocesan representatives, given the Standstill Agreement and the sworn deposition testimony of both Bishop Lee and Bishop Schori, to now take to the airwaves and claim that the CANA congregations sued and that the Diocese's legal actions are merely defensive. I like RWK's allusion to arguing about Munich on D-Day. That strikes me as about right. I'll leave this thread by saying that I think there can be a settlement on the Diocese of Virginia issues and that that settlement is preferable for all parties, almost regardless of its content, to litigating in the trial court into the summer and in the appellate courts for the next two or three years. I just hope that the Diocese does hold fast for some kind of lease to the departees or some other form of retention of ownership rights to the Diocese that permits continued Episcopal use (perhaps on a shared basis) of at least the historic church at Truro. I have no doubt that The Falls Church will be returned to Episcopal worship.